Daily Illuminator: Our Quirkiest GURPS Supplement Ever! May 10, 2014: Our Quirkiest GURPS Supplement Ever! The GURPS Power-Ups installments have been among the most popular GURPS offerings, thanks to their enticing bite-sized morsels of game-improving goodness. Now, our biggest Power-Ups yet looks at something small but significant: quirks! GURPS Power-Ups 6: Quirks offers a look at those little things that help define a hero . . . and give them extra character points as well! Written by GURPS grandmaster Sean Punch, this volume includes nearly 200 quirk possibilities (many highly customizable). It also greatly explores and expands the world of quirks, offering invaluable insight into what makes them fair, why there are limits, how you can add or remove quirks, and more. 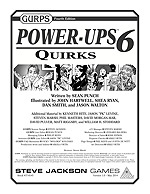 If you've ever wanted to give your hero a slight edge in available character points and provide him with new roleplaying possibilities, then GURPS Power-Ups 6: Quirks has what you need. Download it today, only from Warehouse 23!